Nicole of Attitudes are Contagious, Mine Might Kill You from New Jersery, USA had sent me this nice package full of thoughtfulness. I could see that a lot of homework was done before she put together the package. 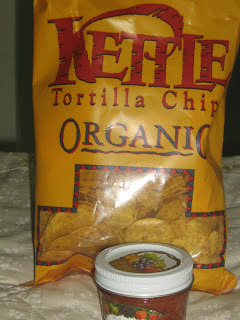 First up .. she had included in her package a pack of Organic Tortilla and a jar of Homemade Tomato Salsa .. oh yes, the tomatoes are from her own garden ..
Also included were a Xmas card full of explanations of each item she sent, a big jar of Chocolate Dip Pretzel Rods and Haribo Gold Bears Gummy Candy for my two angels. 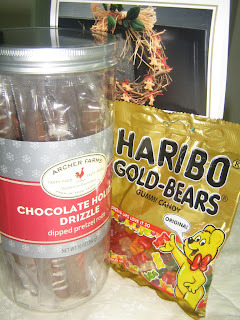 She had read in my blog that I have kids and had thoughtfully included those gummies for them. 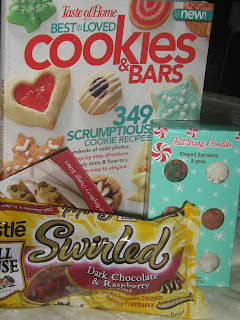 Learning that I love to bake, Nicole had thoughtfully included too in the package, a box of Shaped Sprinkles, Swirled Dark Chocolate and Raspberry morsels + recipe cards (ooh .. i just cant wait to use these .. i havent seen these in Singapore) and Cookies and Bars recipe book (oh yes .. 349 recipes in that book alone). Thank you Nicole .. I love each and everything u sent me and thanks for being so thoughtful. 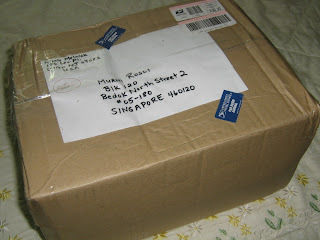 I could see so much love and care that is put in to prepare this parcel for me. My hugs and kisses to you lil son! Thank you to BBM host, Steph of Dispensing Happiness .. u go gerl!